Whenever using a new technique or new product, I always like to start small. This gives me the chance to play around without getting too attached to the outcome and gives me an indication of whether or not my ideas will work in the selected medium. That’s why I have a bunch of 1/4″ mdf coaster substrates cut to four inches. Cutting No Days Groutless Mosaic Adhesive with an exacto razor. Placing glass tiles on the coaster substrate. 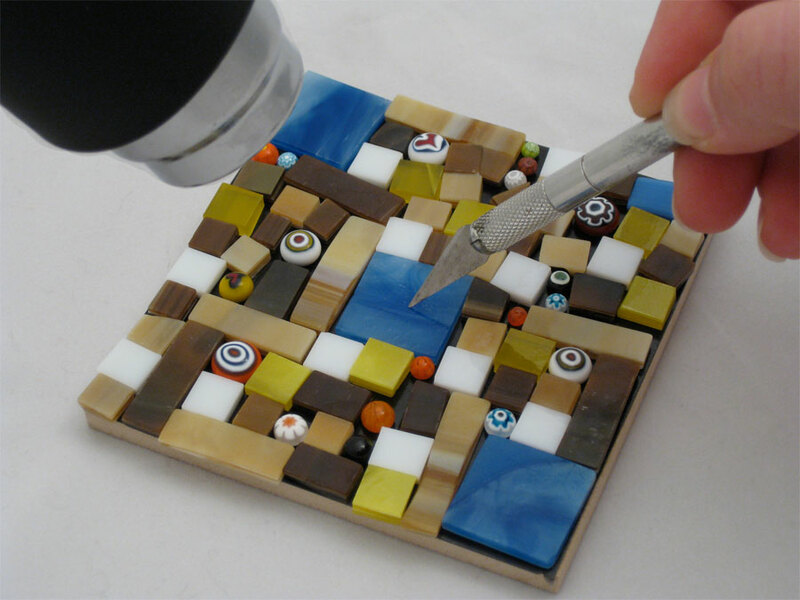 Heat the Groutless Mosaic Adhesive to set the pieces. After you’ve covered the adhesive, it’s time to heat set it. I call the Groutless Mosaic Adhesive a “participatory adhesive” (totally made up technical term). You really need to get in there and work with it as you’re heating. As it begins to liquify, some of your pieces may start to shift and move around. It’s okay, that’s supposed to happen, at first! If your pieces start sliding around and things are getting out of control, then turn off the heat gun and set it aside for a moment. Glass and ceramic are insulators, so they’ll hold the heat for awhile allowing you to move them into place. When the pieces are in the right spot, you need to push down on them to make the excess adhesive (causing the tiles to swim) press out from underneath the tiles and rise up around the outside edges of the tiles (to act as the grout). If the tiles stop moving, or the adhesive starts to wrinkle or ripple as you move your tiles, grab that heat gun and start heating again. Completed sample tile in less than 30 minutes. Once you’ve heated, moved and pressed on your tiles, you need to let the mosaic cool down. If you’ve been a good date and heated the glass or ceramic thoroughly, then it’s going to take a bit longer for the mosaic to cool down. Use this time to start another sample and switch things up a bit! See how far you can push your ideas. NOTE: I forgot to mention that sometimes the Groutless Mosaic Adhesive will shrink up while you’re heating, exposing the surface underneath. Don’t panic! Use your tool to push on the tiles, using them to move the adhesive around and cover up any bald spots. Create several samples tiles to create a larger mosaic of mosaics! Once you’ve created tiles, try building on a glass surface. Keep it small (~4-6″) and don’t forget to keep your heat gun moving. Larger pieces of glass can thermal shock when heated unevenly. 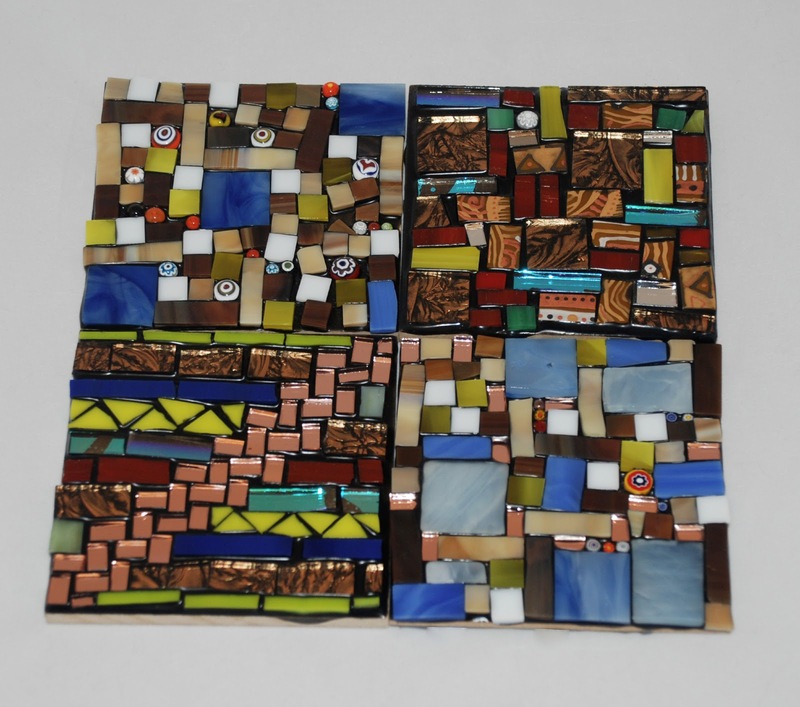 For more on glass on glass mosaics using Groutless Mosaic Adhesive, check out this post.